Bob Gooderson has sent along some very interesting pictures. The closest date I can guess is 1981/2. The new station was already in use. The old station platform canopy had already been moved sideways so that Pine Street could run right through. The building which became The Workshop had hardly been touched. 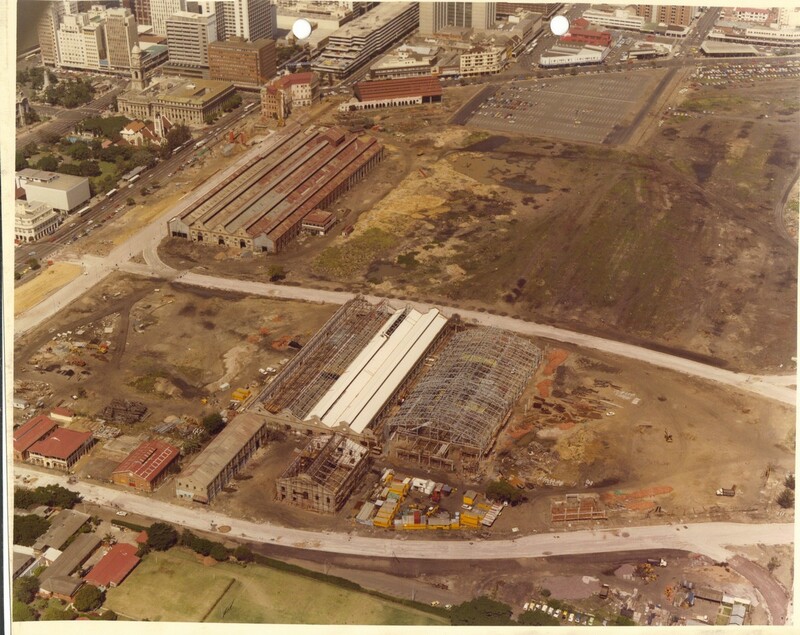 Can anybody remember the date on which the new station in Umgeni Road opened as that would give an accurate starting period? A label on the back of the picture says ‘Patrick Squire Photographer’. Here are a few more from the family archive including pictures of taken of (or from, I assume) their hotel, the Lonsdale. Great photos there especially the one of the Durban Station site. That is an exceptional photo showing what it looked like once it started being redeveloped. Just one correction. Pine Street always ran past the station as it ran in front of it. Commercial Road used to glide right into Gardiner St. With the separation of the station building and its platforms, Commercial Road was now extended and I think it joined up with a road called Pine Terrace that ran parallel to Pine Street. I agree with you that the station redevelopment took place in the early 80s. The photos of the redevelopment of the Lonsdale are very interesting. My wedding reception was held in the new section in 1970. I cannot remember what the room was called but it was upstairs and vaguely recall there was a swimming pool with a Mayan (?) theme to it. The lower floors (above the Borgward in the picture) were car parking bays and at ground level, weren’t there petrol pumps and this exited into West and Palmer Streets? The other photos show the Point Road corner prior to it’s redevelopment with the erection of the multistorey block of flats on the site now and the others show West Street when it was still two way and it ended up at the Lower Marine Parade. I am working on the identification of the buildings and immediately spot the Belmont Flats and Ottawa Court on the right hand side in picture 5. Eagle Taxis operated out of there. The Ottawa Cafe was at street level. Great photos thanks for posting. Looking at Pictures 4 and 5 which are more or less the same view, I would reckon, looking at the big American cars these photos were taken in the late 50s/ early 60s. I recognise some of the buildings but used the 1968 Directory to identify them correctly. The view is looking down West Street extending to the sea. I seem to remember that at the very end of West Street there was a circular smooth concrete are where one could roller skate or small kids ride their tricycles. The local pigeons used to congregate here as well especially when being fed peanuts by the holiday makers. At the end of West Street coming from the left was the Lower Marine Parade which extended a long way back passing the Paddling Ponds, the Cuban Hat / The Nest the Beach Baths and so on. The Lower Marine Parade on the sea side was lined with big brown rocks which had been embedded but were no barrier for the spring tides which used to send waves crashing over them. West Street at this time was still a two way street. Looking right down on the right hand side there is an old rotunda type building which housed the Coo-ee Restaurant as well as the Wax Museum and Chamber of Horrors. Then there was a walkway called South Beach Walk which skirted the South Beach area leading to the Mermaid Lido. Then as can be seen was a grassed area which had a kiosk where bus tours could be booked. There are two buses in the picture. Then comes the West St / Marine Parade intersection. Marine Parade extended left and right here along the whole Beach frontage. Looking at the buildings now, right hand side on the cnr of Marine Parade and West St is the Belmont Flats. On the end wall is the Eagle Taxis sign and if you look directly under that there is an arched entrance to the underground taxi parking area. Taxis were dispatched from this point. Then comes the quaint Echoes Hotel building with steps leading up to it Next to the Echoes Hotel is the large Ottawa Court which completed the block as far as Gillespie St. The Ottawa Cafe was at street level along with many other small shops. 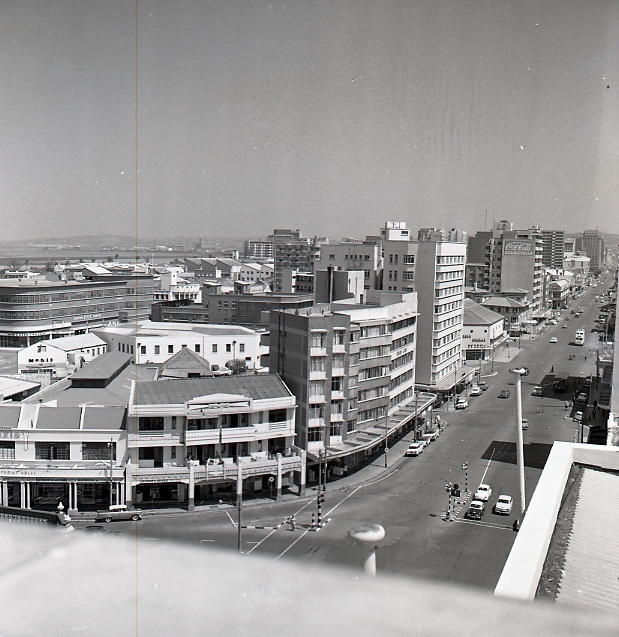 Looking at the left hand side now and these are not in the picture but opposite the rotunda building was the Centenary Aquarium (1954) … now demolished and replaced by Ushaka …a charity wishing well and there was also a wooden bandstand in the vicinity. Then one can see the Beach Hotel, sign on the side, which was relatively new then. At street level here was a ladies boutique called ZUT and if I remember correctly the owner was murdered in her shop in the 1990s. Then one comes to the Hotel Cecil, Parade Court and the Eastbourne Hotel. You can see the two roofs in the picture one is tiled the other corrugated. Then the flat roofed area covered the Beach Arcade which ran between West St and Palmer St at the back and the Rio Grande Hotel. This completed the block again as far as Gillespie St. The pictures were taken from the redevelopment of the Lonsdale Hotel site, this being the car parking bays and the multistorey room accommodation that was to come. I knew this area pretty well because the rear of the Beach Telephone Exchange complex was in Palmer St directly opposite the Beach Arcade and I worked in the building from 1973 to 1990. The front of this building was in Seaview St, you may know it as the Marine Parade Post Office. The Beach Arcade site was completely redeveloped with the arcade not being reinstated. The Mykonos (remember: eat as much as you like?) was situated here. Over the years this whole area was redeveloped and I would venture to say virtually nothing you see in the picture now exists apart from Ottawa Court. Picture 2 : Redevelopment of the Lonsdale Hotel. The picture shows in the foreground, the block between Brickhill Road and Gillespie Street. Looking further in to the distance it is West Street between Brickhill Road and John Milne Road. I am referring to the right hand side of the picture. Of interest here is the record of what stood on this section of West Street from Gillespie St to Brickhill Road in 1938. Gillespie St. then Rand Pharmacy, W. Morrison, The Rand Grocery, C.P. Mellet, B de Bon, T. Collins, P Tooley, E. Barclay, M. Watson, Mrs S. Hodgson, Lonsdale Hotel Ltd. and Bakers Ltd on the corner. Crossing Brickhill Road, there was the East End Post Office which shared the corner with Whysall E.S. Chemist, Federated South African Meat Industries, D.H. Miliken, Vacant ground and then John Milne Street. One can only assume that where individuals are mentioned these were their individual homes. In 1968, this had changed to Gillespie St. then Netherlands Bank, Fashion Inn, Take-away Caterers, Central News Agency, Lonsdale T.F. C. Motel , Glen’s Sports Bar, Home Gifts and Produce, Sterling Auctioneers, Surf Centre, Lonsdale Hotel , Bakers Ltd. Across Brickhill Road, Whysalls (Pty) Ltd on the corner, Whysalls Studio, East End Butchery, R. Farrar, J. Ivy (Pty) Ltd. In the 30 year gap, this section must have gone some redevelopment with the original Lonsdale Hotel and Bakers the only two premises that survived. Across the road Whysalls is the only firm that remained in place. Interesting is that in 1968, the Lonsdale T.F.C. Motel was in place. I am not sure what the connection with the Lonsdale Hotel was but T.F.C. was the Travellers Facilities Club which used to operate as travel agents in Durban. My late in laws were members and they went on a TFC tour to the UK in conjunction with Union Castle Lines in the early 70s. The picture shows Fashion Inn and CNA still existing. Looking at the Volkswagen to try and date the picture, it has the enlarged windscreen which was a design change made about 1965/66 and the Ford Zephyr looks early 60s as well. The car in front is a Borgward Isabella, which at the time was apparently a car ahead of its time with the features it offered. As can be seen, the whole section from Bakers to Gillespie Street corner was being redeveloped. The original Lonsdale Hotel was kept intact (see “Lons” on the top) and the entrance was converted into the El Castillian / Bullring Night Spot of the mid 60s if I recall correctly. The distant premises are hard to distinguish but Whysalls Corner was a definitive in my time as a marker when giving street directions. I recall Claude Whysall in his white safari suit and later Jeremy his son taking over. I used to purchase all my photography requirements there when I had a dark room going. I would say at the time Whysalls cornered the camera / photography market in Durban in that they stocked everything you required. They used to issue a complete catalogue of all photographic stock. In later years Whysalls bought a property further down Brickhill Road and this became the camera and photographic supplies centre. Upstairs was a camera museum set up to house Claude Whysall’s collection. With the change in demographics in the area, Whysalls moved to the Pavilion and an outlet in the Umhlanga and the West Street corner site was sold (?) . The Brickhill Road outlet was retained but reduced in size. I seem to recall that the camera collection was disposed of but I am not 100% sure of this. 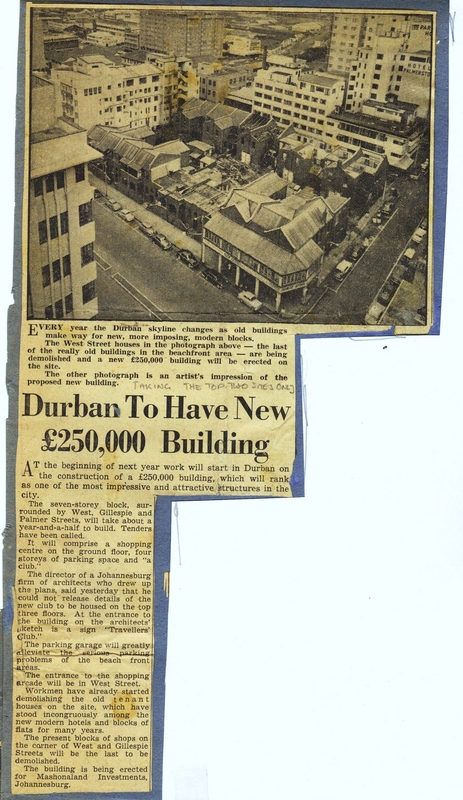 J R Ivy (Pty) Ltd. on the corner of West St and John Milne Road was probably the best curio shop in Durban in the 60s. The shop I recall was filled with curios ranging from animal hides to elephant feet side tables. They undertook taxidermy as well. In this block as well, was a combined baby’s clothes and cake shop and I do vaguely recall the butcher shop. The Coca Cola sign has St Moritz above it. That is the block of flats in John Milne Road. Recall a blind date living in that block! Bakers Corner and the whole property was eventually sold. Their premises in Brickhill Road were demolished and the site redeveloped as a mall which stands today. The Bakers Corner was also redeveloped but I have an idea the original building was modified and added to rather than demolished. Originally it was given a stark black glass facade. 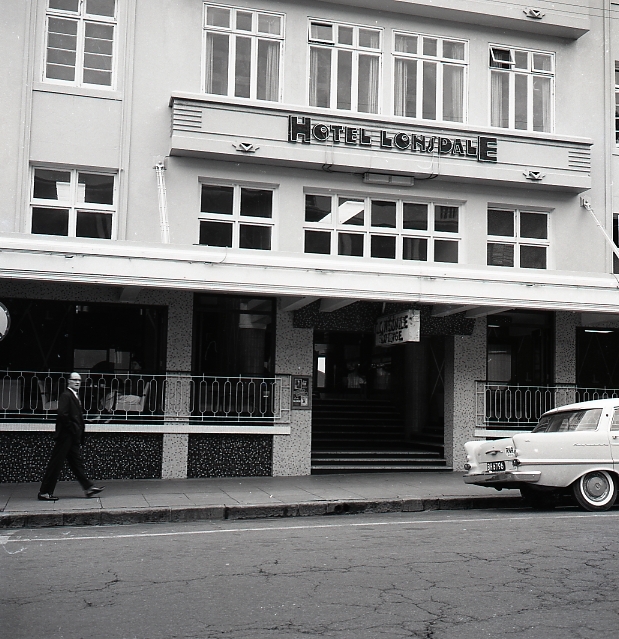 The Lonsdale Hotel was completely rebuilt, the arched entrance can be seen. 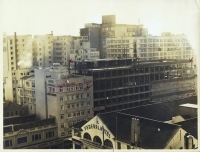 It became a very popular hotel with the Transvaalers on their annual July migration to Durban by the Sea. My relations from the Western Transvaal stayed there quite often. The entrance lobby with the lifts right there used to be a melee of people in the mornings all giving instructions to the children what the plan for the day was! Big changes came later when West Street was changed into a one way , towards the Beach, simultaneously Smith Street became one way into town. Later still the section of West Street between Gillespie Street and Marine Parade was changed into a pedestrian mall and bricked over. I do not have dates for these changes but it did necessitate changes to Seaview Street which took the traffic diverted now along Brickhill Road going to the beach front. And to think that this was originally the path to Durban’s Back Beach! This photo I would say dates back to the mid 1960s. I am basing my assumption on the VW stopped at the robot which has the large front windscreen which was a model change in that period. The trolley buses are still operating as well. 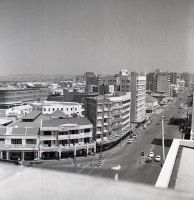 Point Road corner brings back quite a few memories and shows it as I remember it before the whole corner was flattened and replaced by the high rise Coastlands building of today. Looking at the picture I will start at the background and move forward, starting with the double storey building with a big roof opposite the trolley bus. 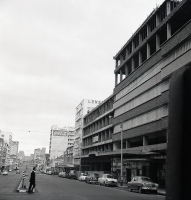 This was the Natal Motor Industries (NMI) building and was the Durban home of Mercedes Benz cars with showrooms at street level. That was at 124 West Street with Kearsney Rd, a diagonal road , on the corner. The tall block of flats is Finsbury Court with at street level the following : The Greek Corner, Geneva Watchmakers, Nicks Cafe, Natal Dry Cleaning Depot, Franklin & Co. and the Beach Butchery. Franklin and Co. I remember as being a Novelties Shop and it stocked a wide variety of what I would call “pranks” stuff. A small shop its window was full of things like “whoopee” cushions those that you put under a cushion to embarrass someone, rubber snakes, imitation doggy poo, stink bombs, eyes you put in ice cubes to horrify guests at dinner, fountain pens that squirted washable ink and so on. Finsbury Court took up the whole block ending at John Milne Road. The next block of flats is Roberne Court. At street level under it was Cheapside Outfitters, Radioland, Gift King, Ocean Watch Co., Woolfsons Bros, Hair Romance Hair Stylists, Woolfson Bros Extension and then West Point Restaurant. These were the myriad of small outlets that seemed to fill this end of West Street. The next two buildings which adjoin Roberne Court are actually in Point Rd so this is where Point Rd ended and West St started on that side of the road. As far as I can make out the one building is Beach Corner House and West Point House. The names are on the frontage but too small to make out. The shops on Point Rd Corner were Army and Navy Cigar Store, George’s Fruiterers, “George” fishing tackle and bait shop, Modern Fish and Chips, Savoy Stores and Crystal Corner Delicatessen. I do recall the fruiterers there as well as the fish shop. They also used to sell bait over the weekend. Late Sunday afternoons, the family would take a drive round the docks along with many others. Access to the harbour was easy and unhindered in those days. As one approached the Customs you got a half hearted wave through from the Customs officials on duty. We used to end up at T Jetty or down at the Ferry Station which was at the very end of Point Rd. My uncle would always have his rod with him and try his luck whilst us kids went roaming around. T Jetty by then had the Marine Terminal operating and if a liner was docked it was interesting to look at the big ships and what was going on. Getting back to the picture. There are two buldings I recognise. The one with Mobil was a service station in Smith Street. Immediately behind it the large three storey building stretching across is the McCarthy Rodway building which was the Austin / Morris/ British Motor Corporation dealership. I have an idea they were also Jaguar and Rolls Royce agents. The show rooms were down stairs and the upper floors were the workshops. The ramp going upstairs was a real test of your driving skills! 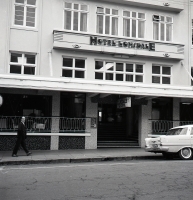 The two flag poles would be the frontage of the Lonsdale Hotel (the original one) and opposite the partial pillared roof top (just visible) would have been the Langham Hotel. As a matter of interest, the Currie’s Fountain “monument” was situated directly opposite Point Road corner for many years. It stood on the pavement area. It was then removed and I have since found it to be reinstated in the grounds of the Botanic Gardens. Probably closer to the original “Currie’s Fountain” than the Point Road site was. I wonder if there was any significance in the original site chosen when it was first erected there. I have added my reminiscences of the Point Road corner picture sent in by Bob Gooderson, aided by the 1968 Lawrie’s Directory. The comments are in the main body of the comment called New Pictures. I love/hate these sites! Bring back pangs of memories! The ‘new’ station must have been early 80’s, my father put in the escalators running down to the road and I sometimes went past on the way back from my Mom’s work at the Technikon. I have corrected the picture in the original gallery. I have added more to the original comment, above, that I made about Bob Gooderson’s pictures. I have added it to my original comment so as to keep everything together. I can expand on the history of the Lonsdale and my family. My Dad arrived from the UK in November 1954 to manage the Ice Cream Department of Clover Dairies which was situated in Victoria Street opposite the Goodwill Lounge. In March of 1955 my Mom, myself and a new wife arrived and I was employed as Production Manager at Clover Ice Cream. Nepotism might have been at work. In March of 1957 my Dad purchased the ‘old’ Lonsdale and I was installed as manager. The business did well and in 1960 or 1961 the four stands between the Lonsdale and Gillespie Street stretching back to Palmer Street were put up for auction. The four stands contained old terrace houses with the Rand Pharmacy on the corner of West and Gillespie. At the auction we purchased the two stands next to the Lonsdale and the second two were purchased by a Johannesburg sydicate of which Travellers Facilities Club was a member. Our idea was to expand the Lonsadale and as was subsequently announced the two stands from the corner were to be developed as the TFC Hotel. All the old buildings were demolished and the syndicate started building. I’m not sure whether my Dad approached the syndicate or vice versa but an amalgamation of interests was agreed to, the building was redesigned and in December of 1962 the ‘Lonsdale TFC Motel’ was opened. There were now a total of 194 rooms, 64 in the ‘old’ Lonsdale and 130 in the new. In the garage section of the building there was a parking space for every room which gave us a tremendous advantage. The total number of beds available was 440 and for the following six years until December 1968 our average bed occupancy was very high. 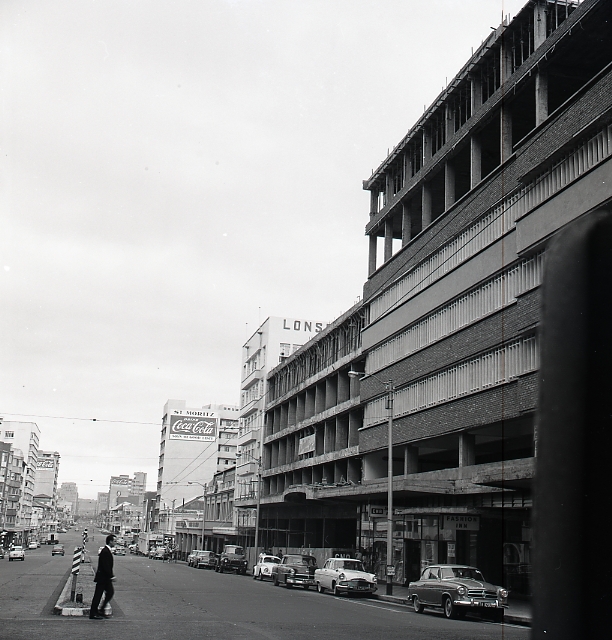 Innovations like the first Entertainments Manager in Durban, entertainment and organised activities for guests from 6:00am until 12:00 midnight, a published monthly entertainments programme, the monthly ‘Miss Lonsdale’ competition, the El Castillian and The Bullring all helped to maintain the high occupancy. I was the very proud General Manager. Derek Mills was the first Entertainments Manager, Julia Painting from Rhodesia was a Miss Lonsdale winner and one December we had all 12 of the years winners back at the hotel to compete for the year prize which was a trip right around the world. There are lots and lots of memories for me and ‘out there’ must be hundreds of people with memories of those good times. During 1967 we decided to increase the number of room by adding extra floors and in December 1968 over 100 further rooms were opened and we could now accommodate nearly 700 guests. During the late 1970’s the family disposed of its interests in the Lonsdale as a conclusion had been reached that it no longer fitted the requirements of the hotel group which was being developed, and so ended one chapter in Gooderson Hotels history. Thanks for adding that. Very interesting. I cannot remember what the Lonsdale TFC Motel looked like. Maybe you have a picture? I assume Clover Dairies at that time was being run by RA Carte. He did become Mayor of Durban at some time. He is associated with the Byrne Valley and is now interred here at the cemetery in Byrne along with his wife. That name Julia Painting rings a bell but I cannot remember for what reason. My 6th floor office in the Beach Telephone Complex overlooked Palmer Street and had a full on view of the rooms of the Lonsdale. I am talking here 1980s/1990s. One could tell what time of the year it was by the occupancy rate. I am gathering some facts about your last photo, the Point Road corner. There were two interesting hotels at one time opposite the Lonsdale, the green coloured Federal Hotel and the Langham Hotel. Both were subsequently demolished in the early 80s I think. But that is another topic. I am probably thee youngest person that visit this site. Great work Allan. Its really pity how the Lonsdale hotel ended up. Julia Painting was a shark attack victim at Margate beach in 1957, where she unfortunately lost her arm. The attack was part of what became known as Black Christmas on the South Coast. You can see I am still old school and do not think to google everything. It’s all there on the internet. At least my memory cells are still charging. The name rang a bell but personally could not place it. Now you mention it, that was it. At St. Henry’s we had one of the three Mikes that were attacked by sharks round about 1960/61. He was Michael Murphy and he lost a leg. Attack was at ‘Toti 1961. There was Michael Land as well as Michael Healey. I bumped into Mike Murphy about 3 years ago in Durban. Some years ago (say 85 years!) my dad, his sister Ray and her fiance, fiance’s brother Bert went swimming at Durban beach and the fiance went missing in the sea. The survivors went back to Joburg and soon as they had arrived received a call that a shark had been caught at Durban, cut open and the remains of a leg found. The leg belonged to fiance (how they could identify eludes me). Now after all these years I still morbidly chuckle when my dad recounted how they had a funeral for the leg in a coffin. Twist to the story is that Bert married Ray. Does the Whysall’s Camera Museum exist in Durban? As far as I know Whysalls no longer exists. The cameras in the camera museum were a collection put together by Claude Whysall and I assume have now been disposed off. Most probably at auction in Europe as it had an exceptional collection of Leicas. 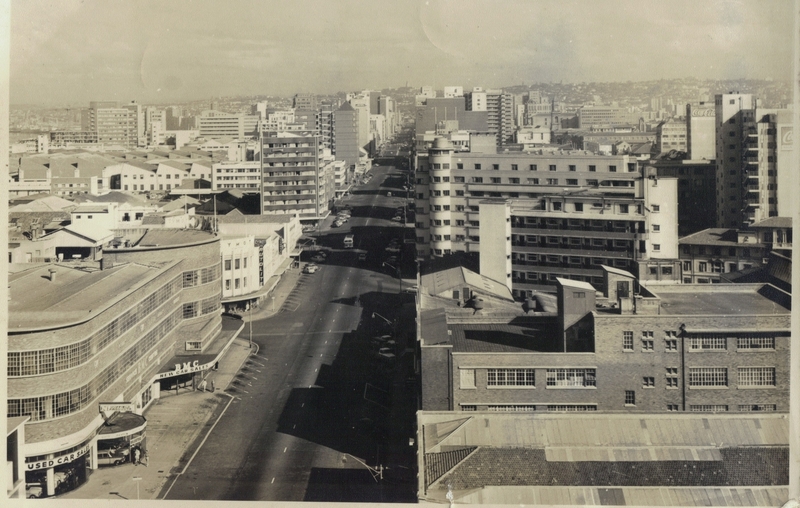 Can anyone help with information or a photo of the McCarthy Rodway car dealership in Durban – in or around 1947? I have a vintage MG sports car which was one of only 16 examples sold by this dealer that year, and a photo of the premises plus info would be a great addition to the history folder I am compiling. Hi.would u perhaps know anything about Charles harry Coles who lived in 91 st.moritz hotel. John milne road.kzn.between 1950 and 1965. Please help me with every info possible..